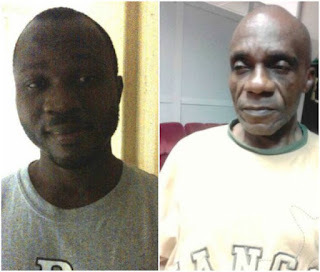 Two drug traffickers, 59-year-old Joseph Oparaji Okechukwu, and 41-year-old Austine Ikenna Nnaji, have been arrested by the National Drug Law Enforcement Agency (NDLEA) for reportedly trying to smuggle drugs out of the country, through the Lagos airport. Confessing to the crime, Joseph who revealed he was a contractor, blamed the present economic recession in Nigeria for nudging him into drug smuggling. The other suspect, Austine, was identified as a safety officer in Qatar. Mr. Nnaji reportedly feigned ignorance of the content of his luggage, which he claimed to have received from a friend at the airport. Okechukwu was bound for New York City on Turkish Airlines while Mr. Nnaji was on his way to Doha, Qatar on Ethiopian Airlines. Okechukwu excreted 1.105 kg of brownish substances that tested positive for heroin. Nnaji, was found to have concealed 11.540 kg of marijuana and 490 grams of tramadol in his luggage.